Code Writing for Kids Workshops! This winter, Code Writing for Kids held two different exciting workshops to get kids coding! Participants became more familiar with computer science, web development, video game design, animation and application design. More importantly, learning to code help increase students’ academic confidence and improve their classroom productivity, keyboarding skills, critical thinking and reasoning and test taking ability; all critical skills for the new Common Core assessments. This club will focus on game development using Scratch (http://scratch.mit.edu/) and will be geared towards introducing participants to animation, gaming, and creating interactive stories. The workshop is designed to encourage student-driven learning, as participants think analytically, design, play, and code in real-time. No prior programming experience is required for this class. Students are grouped by grade (1-3 and 4-6). Students will learn the basic concepts of game programming, and see games as a system of objects interacting, listening and responding to events. This prepares them well for further game development, as well as just about any object-oriented programming language. Using Game Maker Studio (free for Windows) we’ll teach them the basics of programming computer games and by the end, students will have programmed a simple computer game using GameMaker’s drag and drop interface. 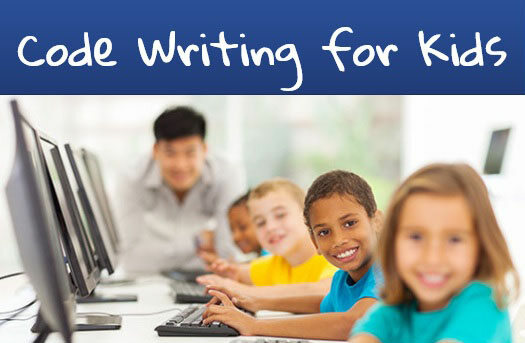 Congratulations to all junior code writers for completing these 8-week long programs!